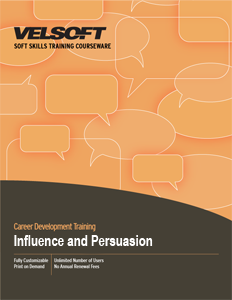 Influence and Persuasion Training Materials for teaching employees the skills needed be influential and persuasive. Confidently train managers and staff how persuasion works, presentation strategies , embed positive or negative commands and more! Seeing is Believing This sample manual to teach Influence and Persuasion is in MS Word format. Trainers can implement our influence and persuasion training materials easily and with little preparation time. This one-day course includes basic communication tools like establishing rapport, mirroring, matching, pacing, and more. There is also information on how to structure a presentation to help students put their thoughts together in a structured, planned way that they can leverage even when they have to deliver on the spot! These interactive training materials include a pre-assignment, detailed instructor guide, student guide, pre and post assessments, quick reference guide and more. If your students like to learn from their mobile devices, ask about our blended learning.